Prog Thrashers SACROSANCT have gone through a period of silence for quite some time. Twenty-Five years of silence to be exact! That silence was shattered with thunderous fanfare this year with the band's latest album "Necropolis." Formed by Randy Meinhard, former guitarist of PESTILENCE, the band gained some fairly decent traction in their home country, The Netherlands back in the early 90's. Thanks to a poorly run label, they didn't get much attention outside their home (their sophomore album art specially and graciously commissioned by legendary illustrator H.R. Giger was tragically ruined by the label's shoddy production team!). 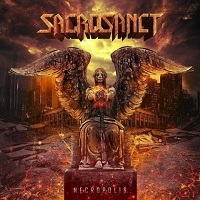 Today SACROSANCT is making up for Twenty-Five years of lost time with their fourth release. "The New Age of Fear" is a whole eight minutes! Not that out of place on a Prog album (eight minutes is considered proper intro length) but less common for Thrash. Taking more notes musically from Hard Rock and Power than from Thrash itself, there is a lot more to do with soaring above what weighs you down in life that partying and starting a raging circle pit. Not that that doesn't happen at all on the album, "The Grim Sleeper" and the blood pumping "NecroPolice" are the best place to find some tidbits of old school Thrash riffs. The overall mood however is still Prog, down to the artwork of a deadly angel perched on a throne in front of a burning city. Heavy themes of ego death ("Clouds Obscured by the Sun"), overcoming adversity ("The New Age of Fear"), overcoming yourself ("My Last White Light") and wrestling with grief ("The Pain Still Lasts") are all the classic earmarks of the genre. After spending years in a dim limbo, SACROSANCT his finally out in the light again and "Necropolis" is the first breath of fresh air they've had in years.